Click on the top 5 image above to find out more. Paloma says, your Students’ Representative Council is meeting on Tuesday in the Large Rehearsal Room (Union Building) at 18:00. The meeting is open to ALL students so drop by to hear sabbaticals and councillors report on their activity the past week. This week we also debate a motion on Out Of Hours service in St Andrews - you can read the agenda here . You can also follow live tweet updates from @StACouncils. Questions about the meeting can be directed to the Association Chair, Jack, at sachair@. Paloma says, Applications are now open to join the SRC Accommodation Subcommittee. The subcommittee is active throughout the year and is responsible for engaging with students in both private and University accommodation. More information about each of the available roles can be found on the application form . Applications close at 23:59 Tuesday the 16th of April. Nick says, Pride is back! Join students, staff and locals alike as we proudly parade through the streets of our town and end up at a vibrant reception where you can meet and chat with a diverse group of fellow pride goers! Open to everybody regardless of your sexual orientation or gender identity. 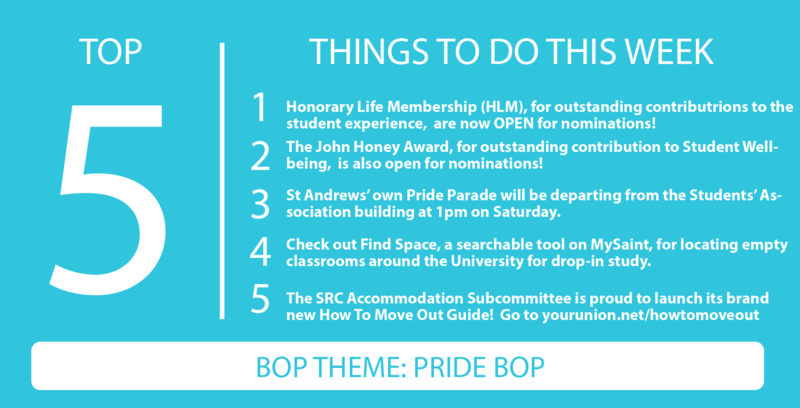 St Andrews’ own Pride Parade will be departing from the Students’ Association building at 1pm on Saturday. Full details here . Alice says, The School of IR has teamed up with the Foreign Affairs Society to take you around the world with the inaugural Ambassador's Ball this Saturday! All students are welcome to join for a ceilidh, live music, and a free drink on entry! Check out the Facebook event here and buy your tickets here ! Jamie says, The Music Society is holding a Symphony Orchestra concert at Younger Hall at 7:30 on Thursday. Tickets are available here . Jamie says, Honorary Life Membership (HLM) nominations are now OPEN! HLM is a gift given by the Students' Association to students in recognition of their outstanding contributions to enhancing the St Andrews student experience. Nominations for these awards are now open online . Nick says, The Wellbeing Subcommittee is recruiting! Responsible for the Union’s campaigns and events related to mental health, safety, sexual health, and physical fitness, the Wellbeing Subcommittee is a great way to try to make life in town a little better. To apply, simply fill out this google form by 11pm on Wednesday the 24th. Jamie says, The Charities Campaign's AGM is taking place from 7.30pm on Wednesday in the Beacon Bar. As a subcommittee of the Student's Association, all students are eligible to both run and vote for positions! There will be free wine and soft drinks. This is a great way to get involved with a student organisation that makes such a huge impact on a variety of amazing causes (we raise over £100,000 every year!) For more information, and to see which positions will be available, check out the Facebook event . Jamie says, The Mermaids: Performing Arts Fund AGM is on Sunday at 7pm in the Beacon Bar! If you want to get involved, check out the Facebook event here . Paloma says, Willie Rennie MSP will be holding a drop-in surgery hour from 16:00-17:00 in Rector’s Café today. All are welcome. Nick says, The John Honey Award, given to one student every year who makes an outstanding and exceptional contribution to student wellbeing during their time at St Andrews is open for nominations . Is there someone you know who has moved heaven and earth to make life better in this town? To nominate someone, send a 450 word statement to dowell@ by 9am on Monday the 22nd of April. More information here . Nick says, A huge congratulations to St Andrews Nightline winning Nightline of the Year at the NL Association’s National Conference on Saturday. Remember that your fellow students are there to lend a listening ear when other services can’t - phone them between 8pm and 7am on 01334 46 2266, or Instant Message them between 8pm and midnight here. Paloma says, On 11 April, Fife Council made the decision to introduce a town-wide HMO Overprovision Policy which caps the number of HMO licenses with no room for growth. On behalf of you, the student body, I am highly disappointed by this outcome. Fife Councillors have yet again dismissed the evidence before them and chosen a way out which benefits neither students nor locals. Many of you will have taken part in a survey regarding locked bedrooms & underused spaces. The results of this survey (completed by nearly a quarter of the student population living in private accommodation), supported research which shed light on the poor yet growing practice of landlords ‘locking off’ bedrooms. The Council actively removed an exemption for such properties from the final Policy. You may recall Fife Council's own town-wide consultation which was also conducted earlier this year - it showed that most respondents aged 16-24, and 9/10 students, supported a policy which allowed for up to 3% growth in the number of HMO licenses, as opposed to one which allowed for 0% growth. In my view, Fife Council has absolutely let down the young population of St Andrews. All this said, let's not have this issue divide us. Let's continue the positive relationships we have with so many locals, let's be a part of the town, and let's show Fife Council that students deserve respect as they are full members of this community and will continue to be so. I wholeheartedly look forward to the review of the policy which will be undertaken over the next three years. I highly doubt this 0% policy will achieve what it has promised and we need to be creative and proactive in looking for other solutions to the housing crisis. I encourage all students to be proactive in this area – become aware of your rights, exercise those rights, and wherever possible do not accept subpar living conditions. The Students' Association will always fight your corner and advocate for you. We can also provide non-directive advice about what your rights are. If you have any concerns about the new HMO policy, please do not hesitate to get in touch with me - pres@. Alice says, Have you been taught in any or all of Seminar Rooms 4. 5 and 6 in the Arts Building this academic year? If so, the University needs your feedback! Please complete the short survey here ! Alice says, The Proctor’s Office is pleased to announce the launch of Find Space! Find Space is a searchable tool you can use to locate currently empty classrooms around the University for drop-in study. This freshly designed search feature, available via MySaint, launches on Monday, 15 April. This tool not only includes an interactive University map and library resource information, it also provides current data on space usage empowering you to make the most of our beautiful University and potentially explore areas you may never have been to before. So should you find yourself in a crowded café, busy office or full Main Library, please make use of this tool to find a quiet classroom space to carry on with your studies! Paloma says, The CAPOD Eggheads have planned to egg-scape for a bit of spring fresh air all day Monday 22nd April. Rumour is they are planning to hide themselves in St Salvator’s Quad. As it is nearly exam season, we need all the stress heads we can get. To claim a reward, all you have to do is find one of the eggheads, bring them back to the CAPOD office and tell us about one of the services that CAPOD offers. You can find out more about CAPOD on our webpages, Email, and Twitter. Alice says, The library is currently looking for students to attend their Customer Service Excellence lunch on the 22nd of April between 1 and 2pm in the Students’ Association committee room. All this involves is giving honest feedback on your library experience to an assessor (with no library staff present) and eating a free lunch! If you are interested and available, please email gh30@st-andrews.ac.uk to sign up! Thanks for reading and remember if you want to get in touch email any relevant sabbatical officer or union@st-andrews.ac.uk with feedback.